In 1898, women lawyers in the District of Columbia could argue before a jury, yet could not serve on one. They made legal arguments in court, but could not yet vote. It was in this context that two lawyers, Ellen Spencer Mussey and Emma Gillett, founded the Women’s Law Class in 1896, with an enrollment of three. As demand grew for an educational institution that would train women who were otherwise excluded from legal academia, in 1898 the Washington College of Law was incorporated, the first law school in the United States founded by women. 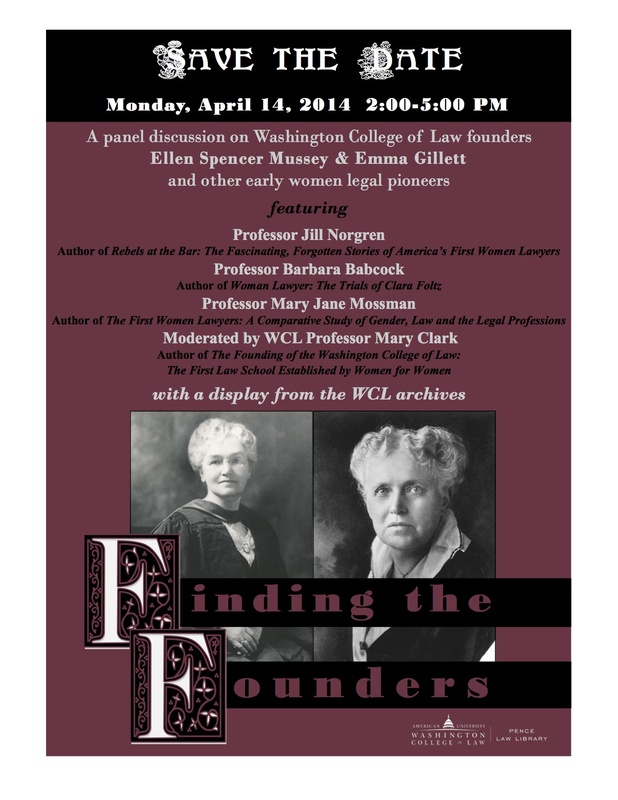 On Monday April 14, 2014 from 2-5pm American University’s Washington College of Law hosts a discussion on the accomplishments of early pioneers advocating for gender equality within the law, including those of the school’s founders, Mussey and Gillett. If you will be in D.C. that day, please join us for what promises to be an inspiring afternoon. Registration and more details here. And for some additional inspiration from women who led the charge for equal rights, visit “Her Hat Was in the Ring!” This blog, co-edited by Jill Norgren, Wendy Chmielewski and Kristen Gwinn-Becker, lauds the political aspirations of women who ran for political office in the U.S. pre-1920, when the Nineteenth Amendment to the U.S. Constitution was ratified, extending the right of full suffrage to all women across the United States. Talk about running against the odds.